"This 1912 Model T Roadster is parked on Main Street near the Fitz residence at Lakeside. 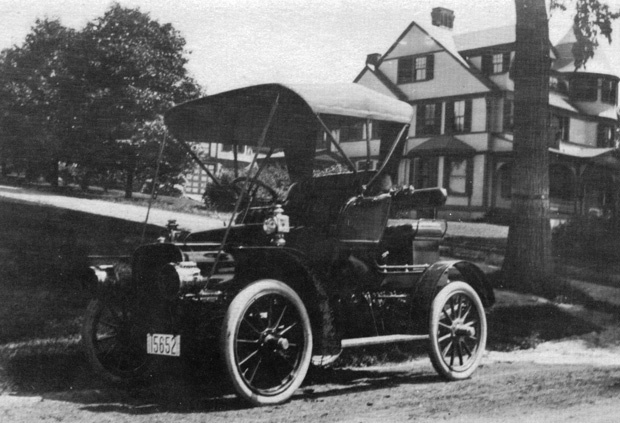 The car may have been owned by Dr. Joseph Heath, a resident and physician whose automobiles were frequently photographed in Wakefield, or to the Purrington family who also owned one of the town's first automobiles. The Fitz residence was built somewhere around 1894 by Peter S. Roberts, a retired Boston merchant, on the site that was once occupied by the home of John White, Sr., and Mary Eaton (White) Aborn. That house was moved to Aborn Avenue. After Roberts' death, his mansion was sold to David Slade, a spice manufacturer. Slade's daughter, Adeline F. Fitz, sold it to the Wakefield Lodge, No. 1276, Benevolent and Protective Order of Elks, in May 1914. It served as the Elks Home until 1956." -- Text from calendar by Jayne M. D'Onofrio. “Lakeside, circa 1912,” NOBLE Digital Heritage, accessed April 22, 2019, https://digitalheritage.noblenet.org/noble/items/show/7004.